The HQ Symphony Pro Foil kite series is for beginner to intermediate flyers. This is a dual line foil kite. 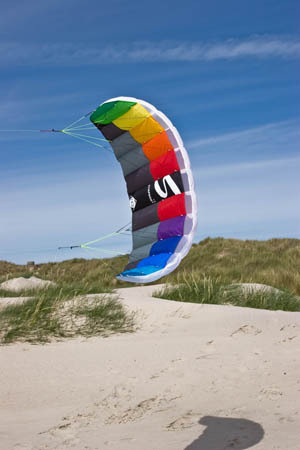 The Symphony Pro 2.5 kite is built durable and has easy handling for a foil kite. The Symphony is of fun on the beach or in the field all you need is wind. The Elliptical shaped sail generate a generous amount of pull and speed for its class. The bridle setup allows the symphony 2.5 to relaunch without help and frustration. These kites are built to last more then one flying session. By a kite and a brand you trust!. THIS KITE ALSO COMES IN A RAINBOW COLOR SCHEME JUST SELECT BEFORE CHECKOUT. well made, first flight in 8 to 10 mph winds,gusting to 20, fairly fast and has a nice pull,didn't fold at edge of wind window, color and design are great, nice foil........only thing I would like to see is the height to be the same as the symphony 2.2 agua one of my best foils. This is an very well built kite. I also have an HQ Symphony Speed 3.2 and 1.9. This kite has a little less aspect ratio and is therefore a little slower than the speed series, but not noticeably so. It is fast, yet very stable. The build quality is excellent. I generally don't like the HQ colors as well as Prism, so I hope that HQ continues the Neon series.